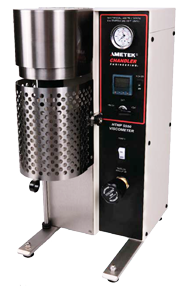 The Model 5550 HPHT Viscometer is a concentric cylinder viscometer that uses the rotor and bob geometry accepted by the energy industry. Its design meets the requirements set forth in ISO and API standards for viscosity measurement of completion fluids at high pressure and high temperature. combination of benefits provides better test results while prolonging the life of key components. Should the bob’s shaft bearings need replacing, a user will be pleased to discover that he can replace them in less than ten minutes compliments of the best-engineered design on the market. The Model 5550 Viscometer is simple to operate. All of the basic operational controls are conveniently located on the front panel. Test schedule programming, control and data acquisition are provided by the Chandler Rheo 5000 software, which operates on an independent computer. The control system provides automatic temperature and pressure profile control, motor speed profiles, and automatic calibration capabilities. The software also features real time displays of test parameters and results. All data is easily exported to a spreadsheet file for archiving and data sharing. See The 5550 In Action! **Several bob and rotor combinations are available.